Another page has been turned on the calendar and it's time for my May "Foodie Parcels in the Post" roundup. Not that anyone appears to have told the weather that as we are now in June it's time for summer. In addition to the products below do also check out what I did with a parcel in the post from Baileys. Boozy Fudge with Cranberries and Pistachios is a recipe not to be missed. There are two olive lovers and two olive haters in our household. Olives seem to be almost as divisive as Marmite. Needless to say I love them (but I hate Marmite!) When my parcel of goodies arrived from Fragata the sun was shining in true Spanish form so it would have been rude not to tuck straight in. 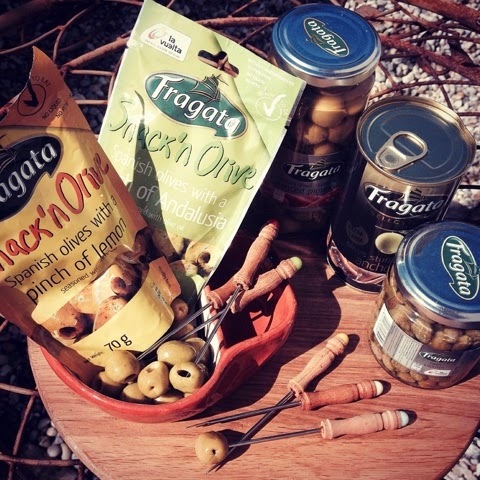 I loved the snack 'n olive concept and hadn't come across olives in that kind of packaging before. Give me a pack of them over a chocolate bar any day of the week. The piece de resistance however was the tin of extra large green olives stuffed with anchovy. I shall be seeking these out again at the earliest opportunity. Oh so moreish. Despite Delia's famed quote "I always have capers in my larder" I'm never quite sure what to do with capers to be honest. I've got a couple of specific recipes I use them in but outwith that any suggestions to expand my capering repertoire would be most welcome. The clue is definitely in the name when it comes to The Ginger People. 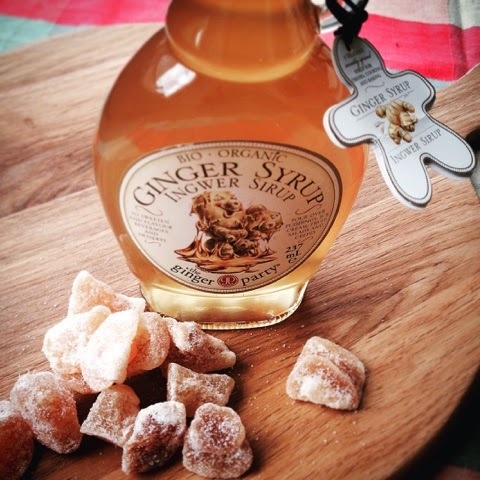 For over 30 years they have been perfecting the craft of all things ginger. Their new range of Organic certified ginger cooking essentials has just been launched which includes minced ginger, pickled sushi ginger, ginger spread, crystalised ginger, ginger baking bits and ginger syrup. I tied out their ginger syrup over ice cream and in coffee and it has a fantastic zing about it. I reckon it's going to prove really versatile for baking, in sir frys and even on top of porridge. 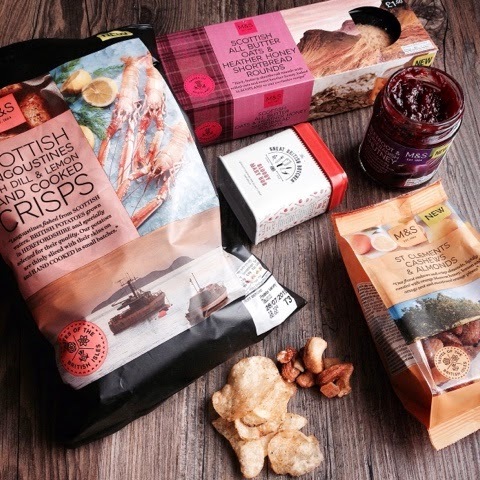 Marks and Spencer sent me across some samples from their recently launched Taste of the British Isles Range. This sees over 300 new food and drink products on the shelves in store, their biggest launch outwith Christmas. The theme is 21st century twists on UK classics. Initially I wasn't too sure about the St Clements Cashews and Almonds but they won me over and the Beetroot & Horseradish Chutney worked very well with the serving suggestion of smoked fish. (Arbroath Smokie Croquettes to be precise) The big hit was the Scottish Langoustine Crisps. They are exactly like a posh version of Scampi Fries crossed with Skips. This is a very good thing. There are lots of fantastic items throughout the range that have caught my eye and I'll be trying out some of them in an upcoming BBQ post so watch this space. Even the sound of Candied Bacon, Cheese & Pickle Burgers, Bacon Belly Rib Strips and Ginger Beer Chicken has me drooling. We just need a summer to accompany them. 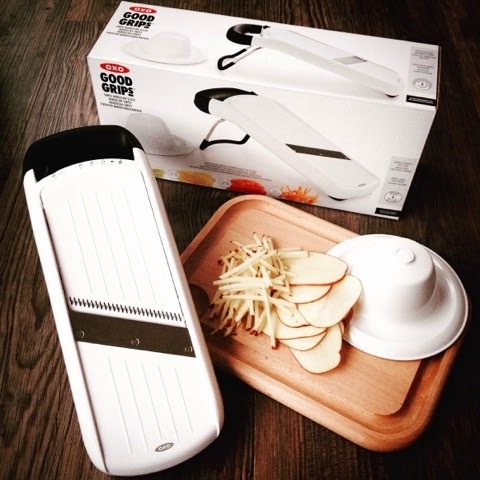 I have been seriously impressed with the Simple Mandoline Slicer from OXO UK. It is so much better than the 15+ year old one I currently have of which the safety holder has long since been lost. The soft rubber non slip handle and feet make it feel really safe and secure on the worktop. Absolutely vital because of its razor sharp Japanese stainless steel blade. It is dishwasher safe which is always a bonus and folds flat for easy storage with the food holder clipping onto the underside. There are 3 easily adjustable slicing thickness settings, a julienne setting and a lock setting as a safety feature for when its not in use. Most importantly, given the very sharp blade, is a spring loaded food holder. My only slight gripe with this is that the prongs on it are quite far apart so you need to have a decent chunk of food for all 3 spikes to grab it. It does however facilitate even slicing and leaves little or no waste. So far I've used it to make dauphinoise potatoes, shred coleslaw, and julienne the beetroot for my Barley, Salmon & Beetroot Salad. When using the julienne setting it doesn't always seem to cut quite so cleanly all the way through and I've had to finish off the job by pulling the matchsticks apart a wee bit at the edges. Perhaps I just don't quite have the knack. Despite this it will become a well used item in my kitchen for all those jobs that you don't want to haul the food processor out for but which need more precision and speed than a knife offers. Clearly I am not down with the kids. An email from Mash Direct talking of no FOMO for vegetarians this summer had me puzzled. A quick word with my own offspring clarified the situation. FOMO = fear of missing out. The vegetable burgers with cabbage are more crispbake/fishcake like in look and texture than traditional meat or veggie burgers. They cooked really well on the BBQ and I expect would work equally well grilled, oven cooked or fried when the weather doesn't oblige. Crispy on the outside and a tasty mix on the inside of potato, broccoli, carrot, cauliflower, spring cabbage & parsnip. Loved these and dare I say it they would also make the perfect accompaniment to a nice juicy steak. There seems to be a national day for pretty much everything. 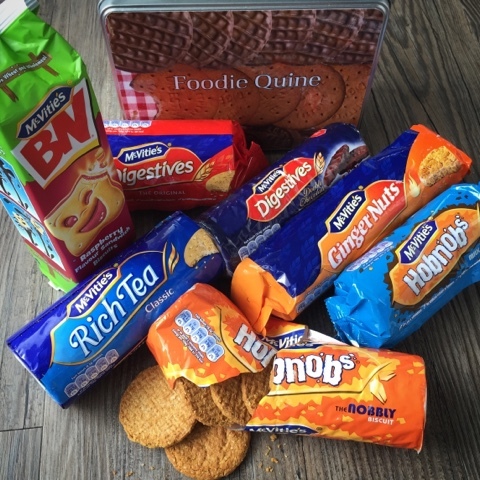 29th May was National Biscuit Day and to help with the celebrations McVities sent me a selection of #sweeet biscuity treats. I'm definitely more of a nibbler than a dunker but if I had to do both Ginger Nuts would be my fist choice as they don't immediately disintegrate in a cup of tea. Foodie Loon has a strange playground game when it comes to Ginger Nuts. Hold a biscuit in one hand and bash it with your other elbow to crack it. If it breaks into three you have a girlfriend/boyfriend. Told you it was childish! Back to the biscuits and my kids absolutely loved the BN's. They disappeared in a flash and a request for repeat purchase has been made for once we have worked our way through the rest of the stash. I've already expressed my love on the blog for both Coast and Glen Fishbox and Tipplebox Cocktails by Post but there is now a third home delivery service that is vying for my affections. 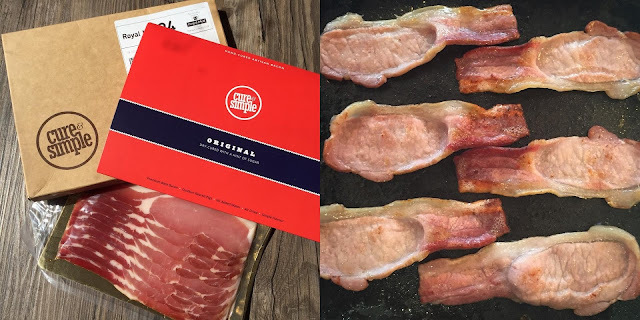 Cure and Simple deliver, through your letterbox, none other than Bacon by Post. Yup. Deliveries don't get much better than this. Outdoor reared British pigs, great flavour, good thickness and no shrinkage or white yuk in the pan. xw6kyd will knock £2 off your order. Despite the super tasty bacon I do hold them partly responsible for my Hearsay Pure & Simple earworm. The remainder of that responsibility rests firmly with Peter Kaye's Car Share and Forever FM. Please let there be a Christmas special. Surely John and Kayleigh have to get together under the mistletoe. Disclosure : Thanks to Baileys, Fragata, The Ginger People, Marks & Spencer, Oxo Good Grips, Mash Direct, McVities and Cure & Simple for providing the above products. I was not obliged to review positively in return. All views expressed are my own. This is not a paid post. The burgers were really tasty but definitely much more crispbake than conventional burger. What a greta little parcel. I really need to get back in the habit of doing the foodie parcels. Its a good way to share any goodies that I get sent for review. 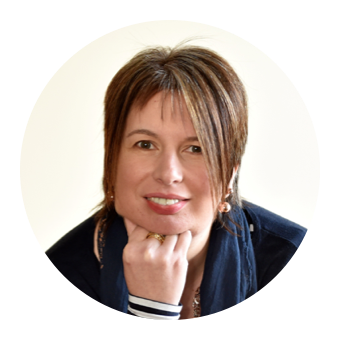 I share them instantly on my social media accounts then a monthly roundup on the blog. Great round up. 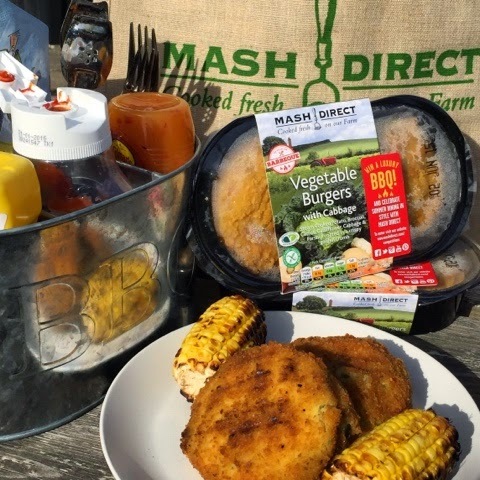 Those Mash Direct burgers look good - will try them at our next barbecue. Definitely worth a try and not just for vegetarians. First of all you captured me at the first picture! BAILEYS!!!! Quite a few awesome goodies!!!! A good day is guaranteed when a bottle of Baileys arrives in the post! 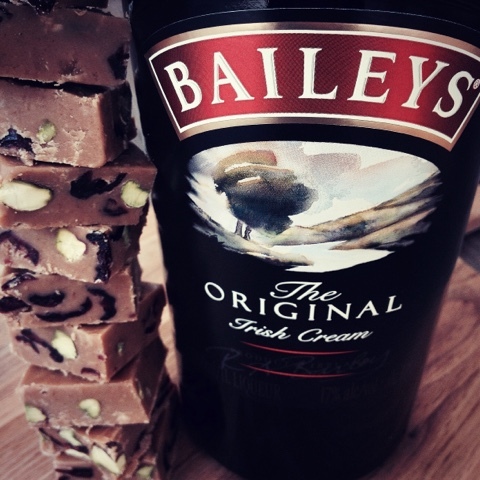 Do check out my boozy fudge recipe with it. Ah that could explain whey there are so many donuts on Instagram today. Alas no one sent me any!